As we kickoff another New Year, we are reminded to begin new habits, behaviors, or traditions. Each new year marks an opportunity for a new beginning, a fresh start. We make decisions that influence our health, our financial status, and even relationships with others. And while we have good intentions in making changes to increase positivity in our lives, we are often met with challenges or complications that keep us from meeting our goals. Most of us find that we lose momentum days, weeks, or months (bless you strong-willed ones!) into the new routines we set for ourselves. It is quite natural to have setbacks as we build toward new habits. Failure is part of the process as we grow and change. The meaning we give to failure is that it is negative. Imagine as a toddler, if you had given up learning to walk after a few falls, what a tragedy that would have been! But because the juvenile mind could not perceive failure as a bad thing, we were allowed to keep trying. We didn’t worry about being judged or criticized. Falling and stumbling was seen as a natural progression to walking smoothly and with confidence. It is through our challenges that we learn about ourselves, how strong we are, how resilient we can be, and what is important to us. I absolutely love what Sara Blakely, founder and CEO of Spanx, had to say about failing. Her dad gets uber kudos from me for reframing her idea of failure! To be successful in whatever challenge you choose, Jeff Haden, author of The Motivation Myth, suggests you focus on a small series of successes rather than the end goal. Each small victory propels you to make more efforts. He adds that motivation is not something that exists within the individual but, rather yet, needs to be created and cultivated. It is through the repetition of smaller, attainable processes that motivate you to keep going. Now I’m not here to tell you what your process should look like or what it needs to include. You can pick up a copy of The Motivation Myth or turn to James Clear, author of Atomic Habits, to learn more about the right kind of processes or systems for your goal. However, I do encourage you to focus more on the process than your goal. When we are goal-oriented, we tend to judge our progress unfairly and it make us feel worse about ourselves which, in turn, leads us to give up. Goals take time to achieve and can leave us feeling discouraged. But by paying more attention to our process, we learn to appreciate our efforts and skills and even gain enjoyment from working through our process. This drives us to staying on a path toward our desired outcome. Take a moment to reflect back on all the things that you’ve experienced over the year. What has been joyful? What have you endured? Have there been challenges you went through that have altered you? 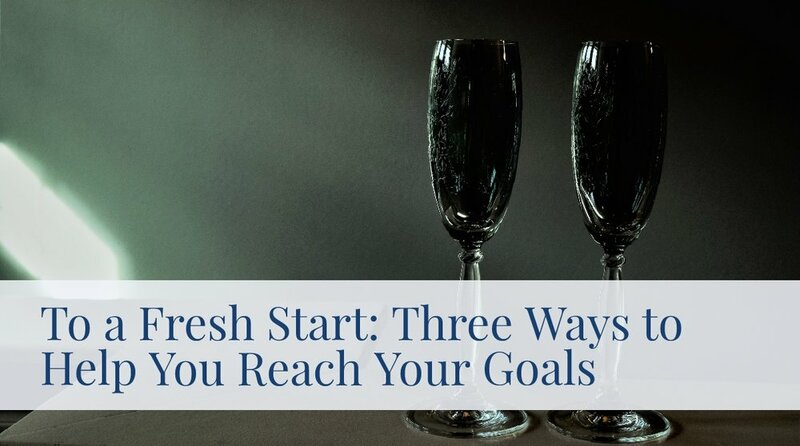 While we look forward to a new year and all the potential there is for a fresh start, it is also important to acknowledge the strengths and tenacity you gained from your past. Looking back and acknowledging our gains and losses helps us appreciate how much we’ve learned or grown from those experiences. We often don’t give ourselves enough credit for the efforts we’ve made throughout the year. How many times did you manage to make it to work on time? How many books did you finish reading? How much writing did you accomplish? What vacations did you take? What have you learned from your challenges? Making an honest assessment about past accomplishments and failures helps us move forward with a greater awareness of what we need in order to achieve new behaviors or habits. Even when you believe you fell short on a goal or resolution, there is something to learn from that struggle. Trying is how we get better! So this year, make it a good one! Take your time to reflect on the past. Learn from what you have already done. Engage in the process and care less about the goal outcome. And most of all, be brave! Welcome failures as they come. It means you are trying!